I missed my 1250k target for last month due to someone stepping out in front of me whilst I was cycling home. I ended up with a pretty painful neck injury which ruined my last 5 days of riding. It meant I didn’t get my stupid little cup, which however meaningless was something I had hoped to achieve. I’ve also got caught up in doing the Strava Gran Fondo challenge thing each month. I like the idea of doing something different to push yourself a bit each month. I first did it on my Brompton in June and then the Dunwich Dynamo was July. I also have September already planned. While there is a concrete goal associated with completion, a truly successful fondo means doing more than just covering the distance requirement. It means deviating from the normal routine. It means going on an adventure. So for August I thought I’d try and do something I hadn’t done before. I came up with a few options and ended up getting given a route from Leo to Brighton. 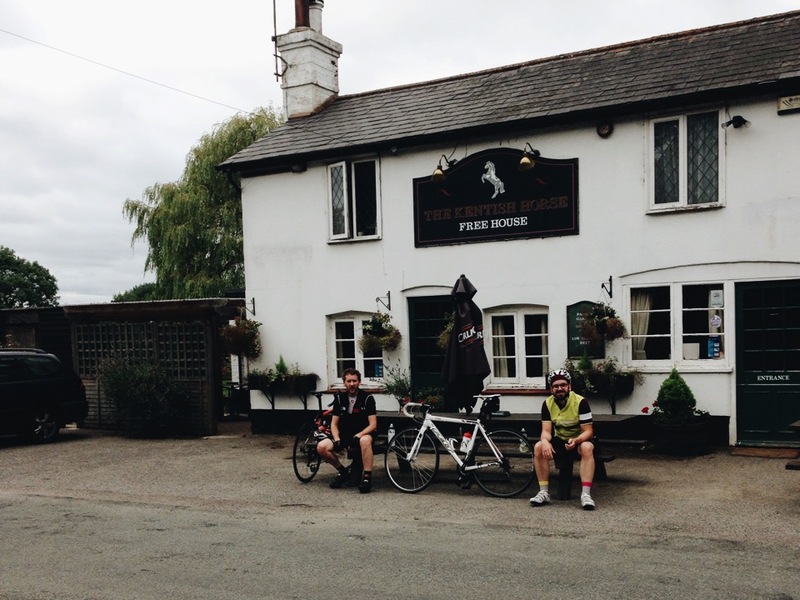 It took in a load of nice hills as well as a being almost entirely on quiet country roads which went from village to village through the Kent and West Sussex countryside. 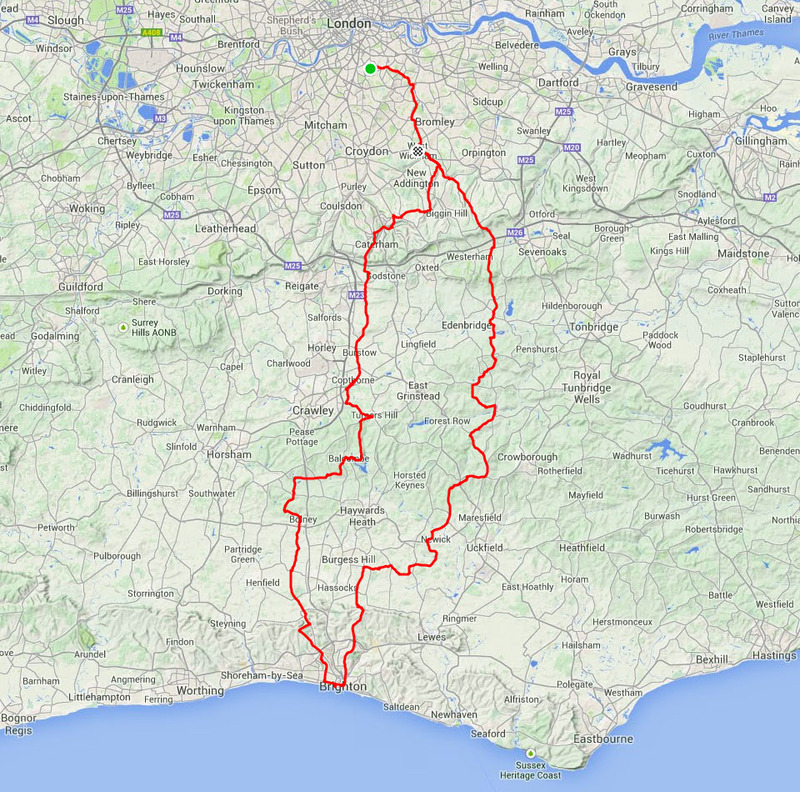 It also included a previously un-tested route back from Brighton which he had included on the off chance. In total it meant a 220k ish round trip which I thought was achievable although clearly a bit of a challenge – perfect for what we wanted though. I like the idea of doing something different or planning a ride to see a different part of the countryside as I’m generally quite lazy and will repeat routes to death. We met at my place in Camberwell for coffee before heading out to Peckham Rye and up over the railway bridge to Brockley. Following Leo’s route was great as it avoided a load of roads I hate using when getting out towards Kent. His took us through Catford but via back roads and then through Langley Park and Golf Course. This was such a complete contrast to my previous route. After that it was past lots of posh villas in West Wickham with a mixture of Tudor windows and Doric Columns as well as other crimes against Architecture. Soon enough were were over the A232 and onto the quiet roads I recognised heading out towards Downe. After Downe we were off out over the M25 which always seems to be a milestone for me, like some kind of breaking of a boundary and setting free. Past this we rode from village to village occasionally stopping to eat / chat / take pictures. The pace of life seemed to be so relaxed round here as dog walkers came past off to collect the papers. More countryside followed as well as plenty more hills and wildlife and a few incredible views. The countryside changed from woodland to more open scrub land and then back again. We even had a few little off road sections to take in which I thought were great. Darren on his new Wilier carbon thing and fancy wheels looked like he was having less fun though. We knew that it was about 90-100k to Brighton on our route but didn’t really know where we were on the map but just kept on plodding on. The kms passed fairly easily although it’s had to know how to pace yourself when you haven’t ridden the route before. Having said that we all knew that Ditchling Beacon was still on the agenda before getting to our lunch stop in Brighton. 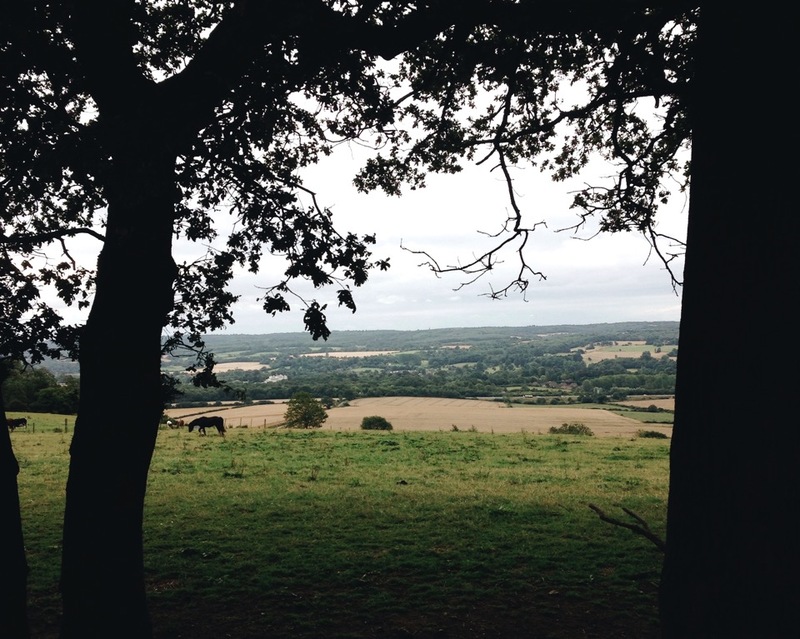 And then the South Downs came into view and there she was. By this point we’d already done around 2000m of climbing so Ditching wasn’t the ideal pre-lunch hill but it had to be done. We all made it up to the smiles of a little crowd who had gathered to cheer their friends on. The ice cream van looked tempting but it was pretty exposed up there and we didn’t hang around for long except for the few obligatory photos to prove we had made it. James looked particularly pleased with himself at the top. Well he did, a little while after this was taken. After that it was simply a matter of rolling down the hill to a slap up lunch right. Well the incredible cross wind on the road over the downs made things pretty sketchy at times. All three of us were tucked in together trying to make ourselves as small as possible but the side wind was brutal. It felt like I was riding at 45 degrees into it to stay upright. Not the kind of place you’d want to be riding with aero wheels! 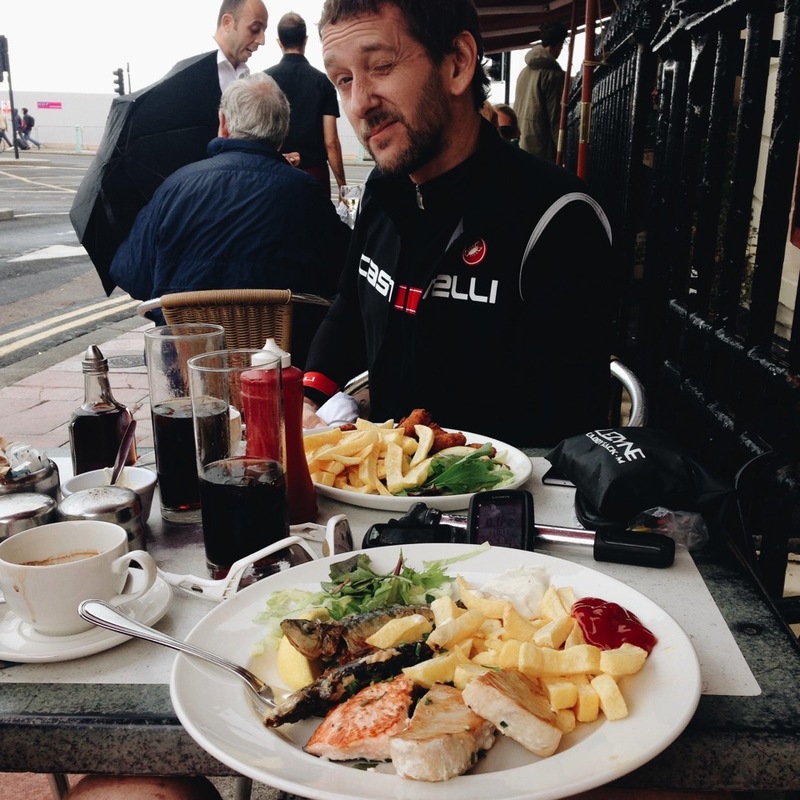 So after wobbling around in the wind we dropped down into Brighton and found our way to my favourite fish restaurant, The Regency. Whilst packed inside we found room on an outside table out of the wind. Three pints of coke and three espressos were ordered. I would have loved to have tucked into a full fish and chips but knew that it was probably less than ideal for the ride back to London. The thought of all that fish in my belly on the climb out wasn’t pleasing. So I ordered the grilled fish medley which was amazing. After lunch Darren (wisely?) departed for the train and James joined me for the ride back to London. Warming the legs up after what seemed like a short stop was harder than I’d imagined. The hill out of Brighton towards Devil’s Dyke was far more gentle than Ditchling but lasted longer. I’m not sure I could have managed the short sharp shock. 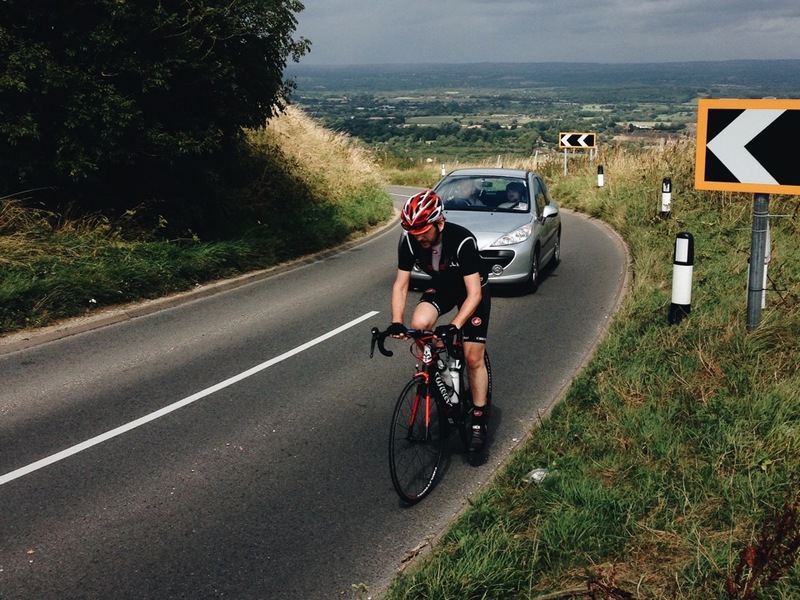 We span out to warm up and admired the scenery to the left and the last views of the sea before cresting the downs. We pushed on and again went from village to village along country roads. Hills seemed harder this time and we ended up stopping a few times at garages to get more food and water. We ended up with a few more off road sections through the backs of farms which looked like they shouldn’t go anywhere but offered lovely quiet short cuts off the roads. 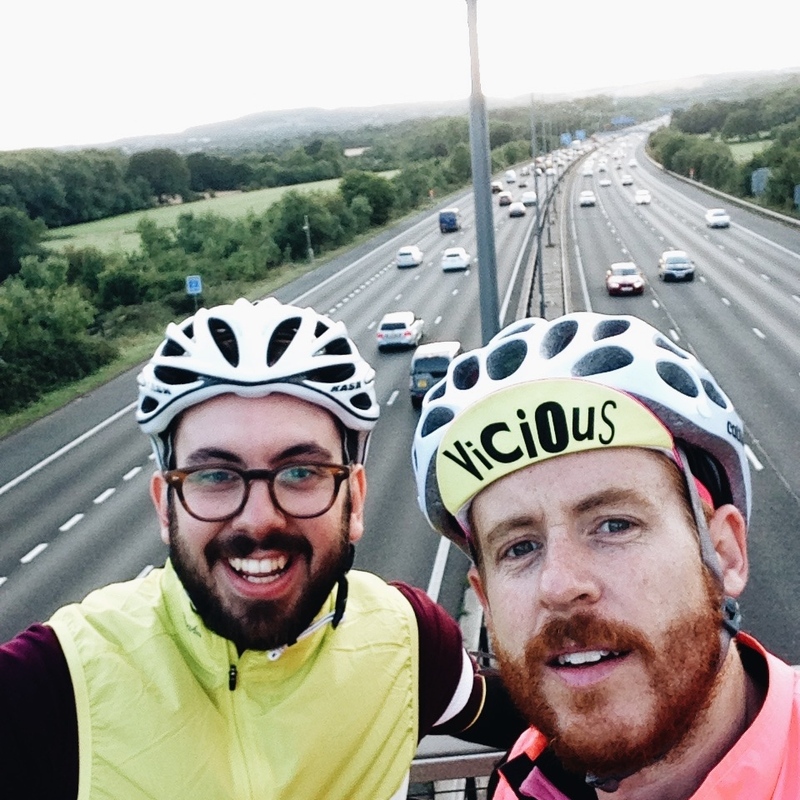 At one point we could hear the drone of a motorway, it was too soon to be the M25 and was the M23 which we we skirting along the side of. Soon enough we were back over the M25 which seemed like a decent milestone to be getting back over it after seeing it earlier in the day. After this the temperature started to drop with the sun going down. Gilets and arm warmers back on we pushed onwards. 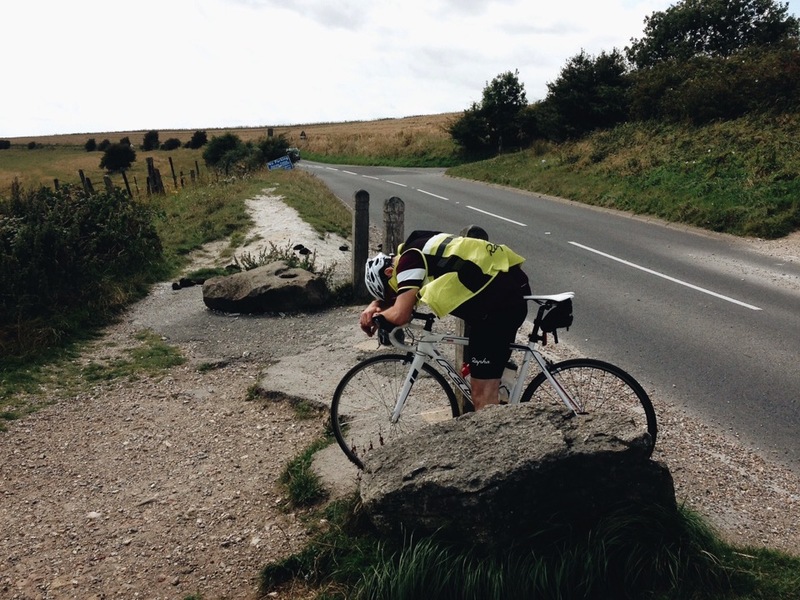 Unfortunately James’ energy levels had also dropped with the sun and we still had a few hills to go to get back into London. James found some energy from somewhere and kept going. The occasional push from me and plenty more food meant we were able to keep a reasonable pace. By the time we crossed over the A232 again my Garmin died at 202k. Panic set in that I was a bit lost even though I was in familiar territory. Having been kind of leading the day I was slightly embarrassed that I’d let this happen and not been more careful of battery use. Whilst I knew roughly where I was, a few incorrect turns ended up in very un-familiar territory. Fortunately James took over and led the way as well a finding his legs and was storming along. Soon enough we were coming back over the Brockley railway bridge and heading back down into Peckham. I’d been promising James a pint since 180k and felt that even though it was 9pm we should still honour that promise. A pint of Sierra Nevada and a falafel wrap were duly inhaled and then I limped up the hill home. The grand totals for the day were 225k of riding and 3,330m of climbing! Quite a day out and it counts as the longest bike ride I’ve ever done. Gran Fondo August done. Needless to say I slept pretty well that night.